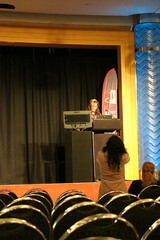 On the weekend I attended the second Australian Romance Readers Convention. At the awards dinner, I won the prize—chocolates from San Churro and some books—for the Readers Challenge. Books and chocolate—can there be a better combination? This entry was posted in Etc and tagged Australian Romance Readers Association, books on Apr 1, 2011 by Kat.